Time to go through these one at a time, and explain them a little more and how they interact with each other. I suggest creating a simple device with one of each direction of pin, like the following, and experimenting with the different types. NC - Many devices have pins that are left unconnected. Perhaps, a pin provides some manufacturer's test feature which is not suitable for a user application. You often see them called 'Reserved' pins. If you would like to represent the NC's in your device set, mark your pin as 'NC'. Pretty straight forward. If for some reason, a net gets attached to an NC pin, ERC will put up a warning. In - Standard high impedance input. These can be connected to Out, IO, OC, Hiz, Pas, Pwr, Sup, and other IN pins. Any number of these pins can be on the same net. However, ERC will throw an error if a net is only connected to inputs. ERC will also produce errors if an input pin is left floating and not connected to a net. Out - Standard 'totem-pole' or 'push-pull' output. These can be connected to In, IO, Hiz, Pas, and Pwr pins. Out should not be mixed with OC, and will give you an error. ERC will give you a warning, however, if you connect an Out to a Pwr pin. If you have an output of, say, a linear regulator, use Pwr instead, which can be connected to Sup pins. IO - Bidirectional input and output. Eagle 6 changed this from I/O to IO. These can be connected to In, Out, IO, OC, Hiz, Pas, Pwr, and Sup pins. There are no special ERC checks for IO pins. IO is the default setting for pin direction. OC - Open collector or open drain. These can be connected to In, IO, OC, Hiz, and Pas pins. Typically, you will have multiple OC pins on the same net, mixed with perhaps Pas pins. ERC will produce errors if you connect OC to anything other that the pin directions listed. Hiz - High impedance output. These can be happily connected to anything except NC pins. Typical designs have multiple Hiz pins on the same net. 3-state devices are dangerous, however. The designer must take careful consideration when designing a circuit with Hiz direction pins. Just because the ERC doesn't complain, doesn't mean you won't burn something up. Pas - Passive. Passive pins can also be happily connected to anything except NC pins. Generally, these are reserved for things like capacitors, resistors, inductors, and other passive devices. Pwr - Power input pins. 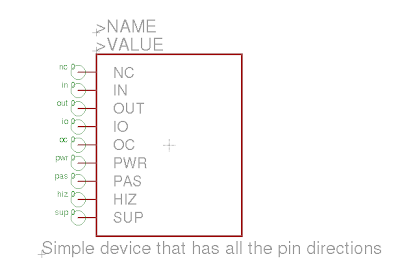 Pwr pins can be connected to In, Out, IO, Hiz, Pas, Pwr, and Sup pins. If the net is not named the same as the Pwr pin, ERC will bring up a warning. 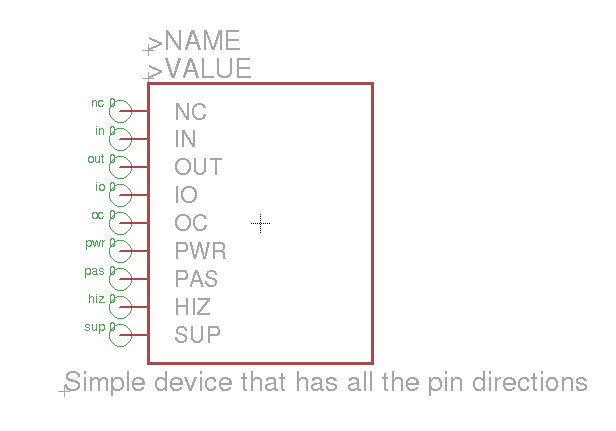 Pwr pins with the same name are automatically connected unless the pin overwritten by connecting it to a net with a different name. Sup - Supply pins. Supply pins can be connected to In, IO, Hiz, Pas, and Pwr. These are special symbolic representations of power supplies. Please do not use these on devices. Supply pins should be used in device sets with a symbol and no package. No problem. It took me awhile to finally track down the documentation, so I thought it might help others seeking for this info. Thank you for your material. It is really helpful for my studying. Much appreciated. Very helpful; thanks for taking the time to write this up. Thank you for the summary. I'm creating a few Pololu motor driver components for a friend's project. I was wondering why the pwr pins automatically hooked up to each other. I surmised operation through experimentation, but didn't really find anything useful in the online help or manual about the behavior of the other function types. Very nice summery. Thank you. Thanks, Stephen for the great info on eagle pin types! Very concise and easy to understand.